energyOrbit comes with a robust reporting and analytics infrastructure to meet all your reporting needs, including regulatory reports. As previously noted, energyOrbit is powered on the Cloud platform from salesforce.com. One of the hallmarks of salesforce.com CRM is the existence of a robust wizard-driven reporting and analytics engine. This engine empowers you to produce dashboards and other graphical representation components of your data. Plugged into the salesforce.com Cloud platform, energyOrbit taps into this powerful reporting engine. energyOrbit will develop all the reports you need for initial deployment; more importantly, energyOrbit will train you how to create and manage custom reports so you can build any report you want (or as many). energyOrbit is designed for managers to excel in. You do not need to know any query language and syntax; any business user with minimal training can begin to generate reports and dashboards. Typically, an organization will designate a System Administrator(s) to manage your energyOrbit environment. Administrators create reports and dashboards for the benefit of the organization at large, while individual users are able to create their own private reports for their own use. With such a reporting environment in place, "blind spots" will be mitigated if not eliminated, and this solid visibility will help you adopt a preemptive strategy to your changing EE landscape, eliminating the all-too-familiar reactive approach to dealing with change. Drag-and-drop reporting, dashboards and analytics allow your teams to quickly see connections, make tactical/strategic changes to improve program effectiveness, and identify problems or bottlenecks. 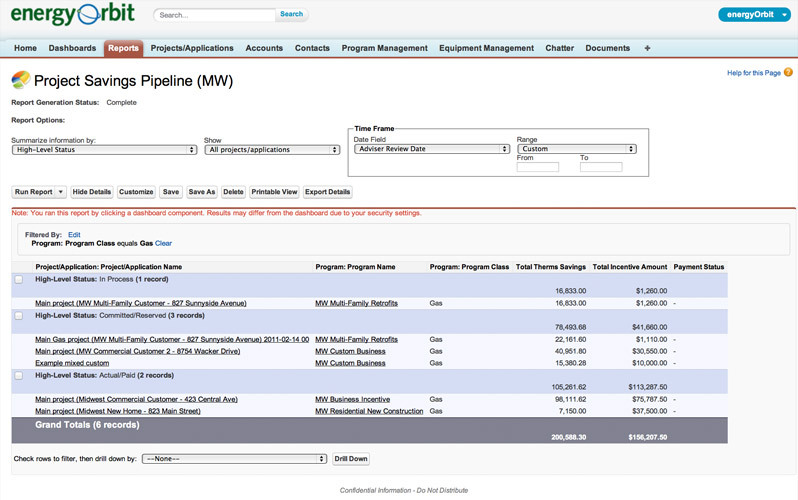 Enhanced, scheduled reports simplify and improve regulatory/management communication. All reports may be exported to Excel or CSV files for integration with MS applications and print-to-pdf. In addition to standard reports, we will configure additional template reports and train your team to create your own reports. Report data can be filtered, grouped and displayed graphically as a chart. Reporting automatically reflects security and access setting for each user and role—each user will only see the reports and specific records/fields that they are entitled to view. Report operators. 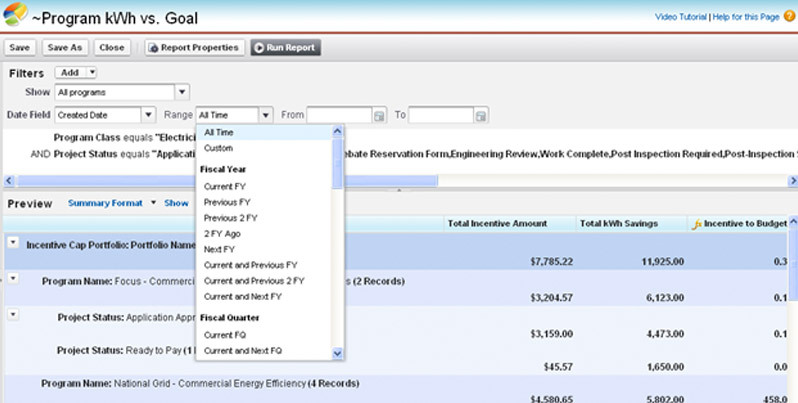 Users are able to easily add filters for custom dates, fiscal quarter/year and the report wizard comes with a set of pull-down menu operators to produce values in terms of data ("contains," "equal" or "greater than," "less than," etc.). Please see the images below for illustration on how date ranges are controlled. Charting, or dashboard creation, is included in the solution and is ready for use "right out of the box." As noted above, System Administrators create dashboards for the organization at large, and end users (with appropriate permission) are able to create dashboards for their own personalized use. 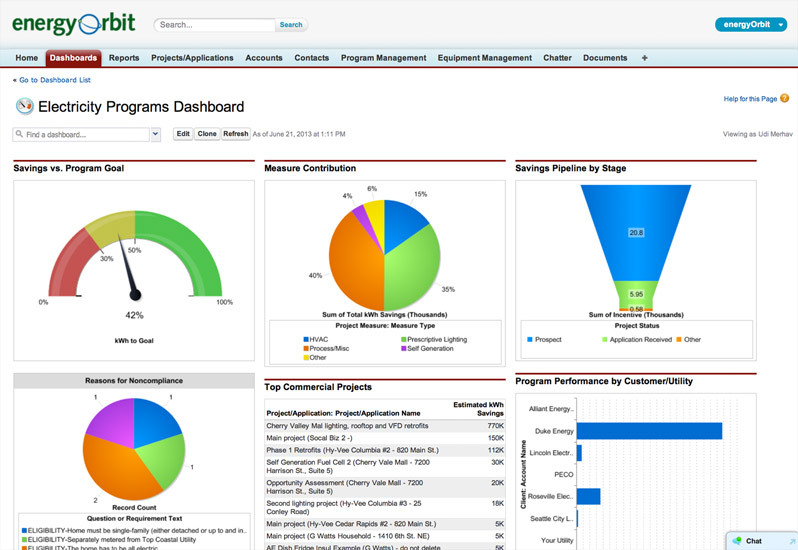 Dashboards are derived from either "canned" or custom reports. It is important to note that dashboard quality is a reflection of report quality; therefore, making sure that the user first feels comfortable with report creation is essential. Please see the image below for a dashboard sample.